“Mudhen Meat and Greens, the popular eatery at the Dallas Farmer’s Market celebrates Easter Sunday with brunch, dessert and cocktail specials in addition to the a la carte menu prepared by Chef Suki Otsuki. 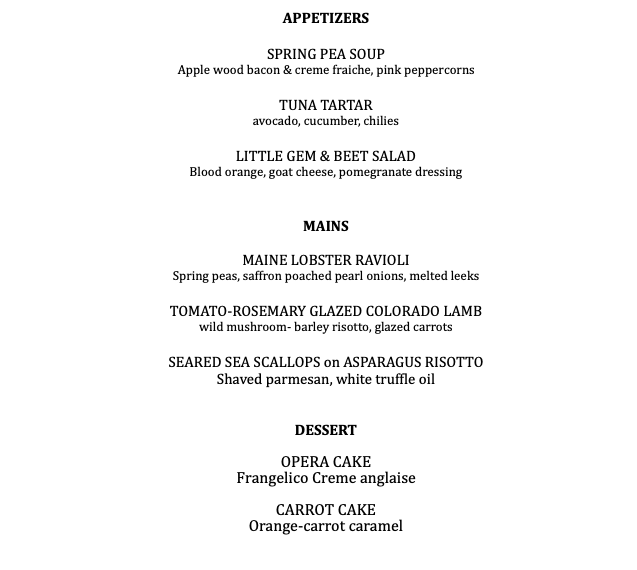 Specials include Easter Deviled Eggs; beet deviled eggs with roasted baby carrot salad and carrot top pesto as well as a 44 Farms Prime Rib Benedict; garlic and herb crusted prime rib served medium rare on sourdough toast points, topped with horseradish Hollandaise and served with crispy herb fingerling potatoes. Lillet Lady cocktails will be featured along with signature brunch cocktails and mimosas. ARG’s latest concept, continues to grow a name for themselves in the Dallas brunch scene. On Sunday, the operating hours are 11 a.m. to 4 p.m. 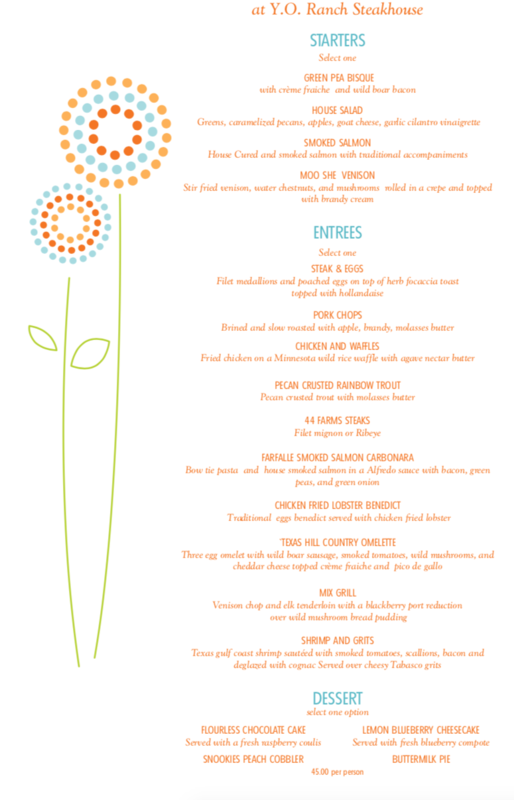 This Easter, Merchant House is focusing on the shareable portion of the menu. 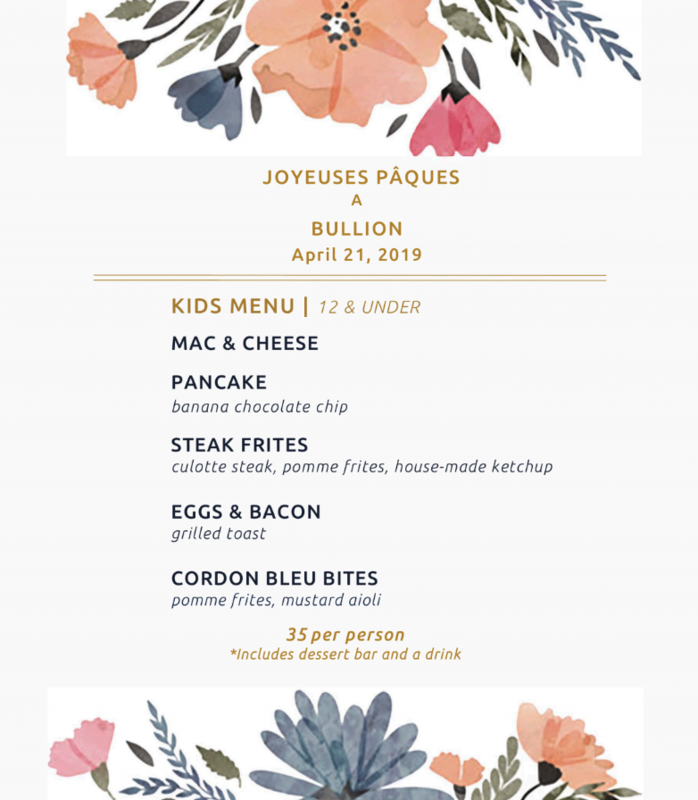 The family-style Easter brunch menu features guest’s favorites with fresh muffins and scones served with Merchant House honey butter and seasonal preserves, biscuits and gravy, pancakes topped with whipped cream, and traditional bacon and smoked sausage. Adults are $30 and $10 for children under 10. “El Bolero Cocina Mexicana will continue their regular Sunday brunch from 10 a.m. to 3 p.m. with a focus on delicious Easter features, such as lobster huevos ranchero for $25, brunch torta for $12, and cochinita y huevos tacos for $12. “Open from 11 a.m. to 9 p.m. Easter Sunday, is serving up a delectable menu featuring seafood brunch offerings and classic cocktails. The regular dinner menu will be available all day, and the brunch menu will be available until p.m. 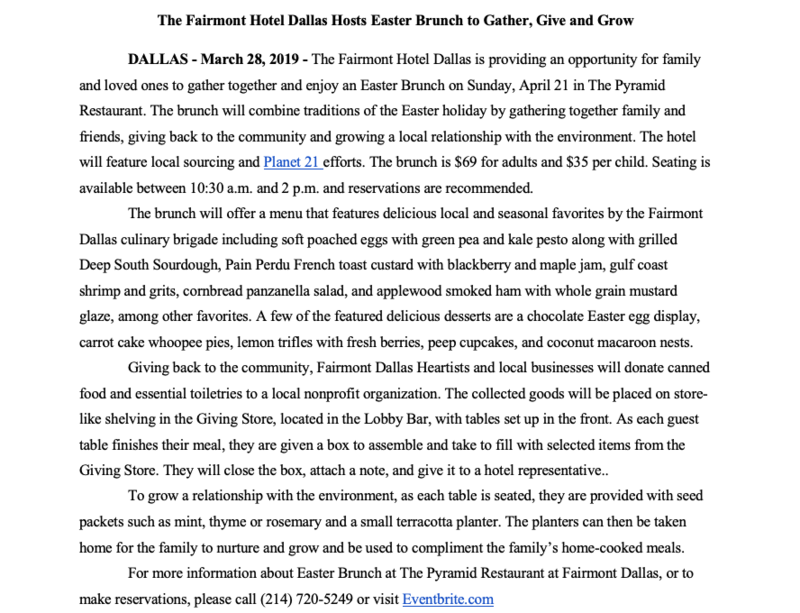 Scout at The Statler Dallas will be offering Easter Brunch from 10 a.m. to 3 p.m., with a special visit from the Easter Bunny from 11:30 to 2 p.m. For $25/adult and $10/kid who are 12 and under. 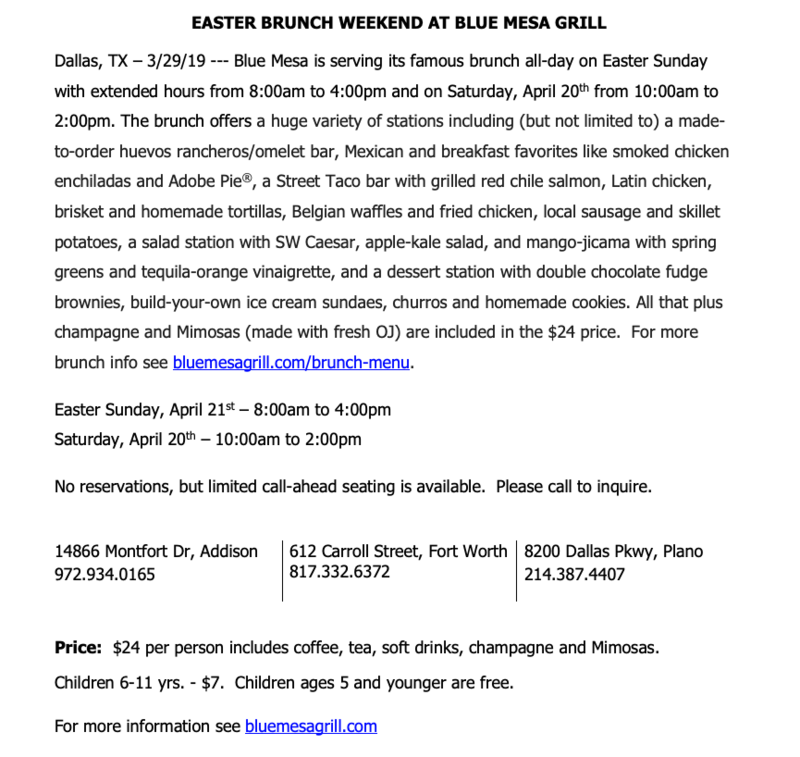 “Upside West Village, located on the rooftop of Canopy by Hilton Dallas Uptown, will be serving Easter Brunch from 10 a.m. to 1 p.m. for $35/person and include one mimosa. “Five Sixty will open its doors for brunch on Easter Sunday offering an array of Asian-inspired breakfast and lunch dishes and spectacular views of the Dallas skyline. 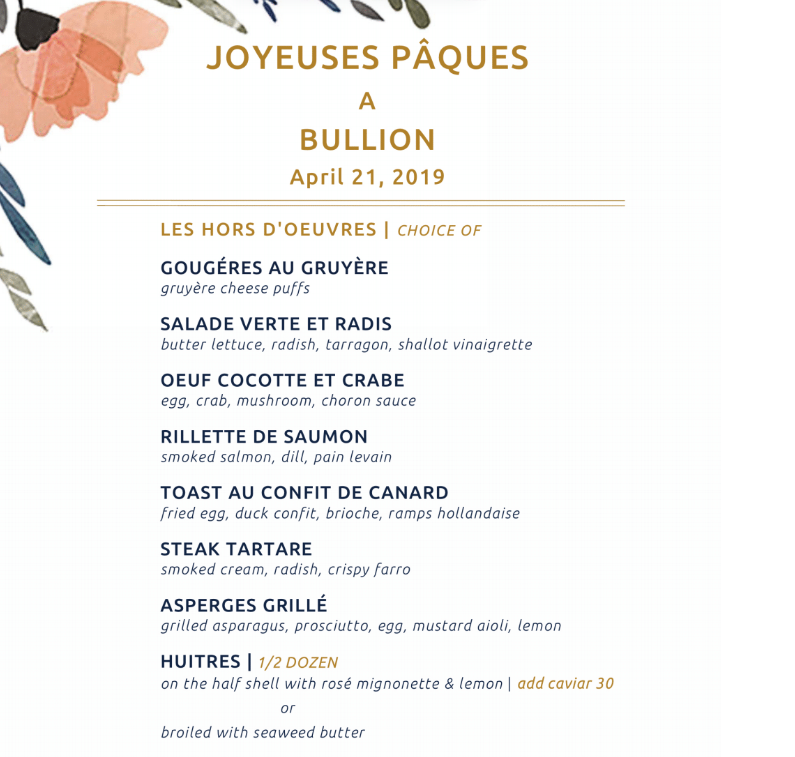 Executive Chef Jacob Williamson’s three-course Easter menu will offer various options for each course, with pricing determined by the main dish selected. Guests will kick off brunch with their choice of crispy shrimp and lobster spring rolls; spring sashimi tower; avocado toast; or a warm spinach salad. Entrée options include Five Sixty “Steak and Eggs” with grilled beef filet, poached egg, caviar hollandaise, watercress and truffle vinaigrette; “Maryland style” crab cake benedict with sautéed “Maryland Style” crab cake, soft poached egg, and red Thai curry béarnaise; Maitake Mushroom Quiche with black truffle, fresh scallion, aged cheddar and Profound Microfarms greens; or Korean fried “chicken and waffles” with doenjang waffles, gochujang honey, sesame, and scallion. Seasonal dessert selections offer a choice of rhubarb ginger panna cotta or decadent chocolate mousse cake. 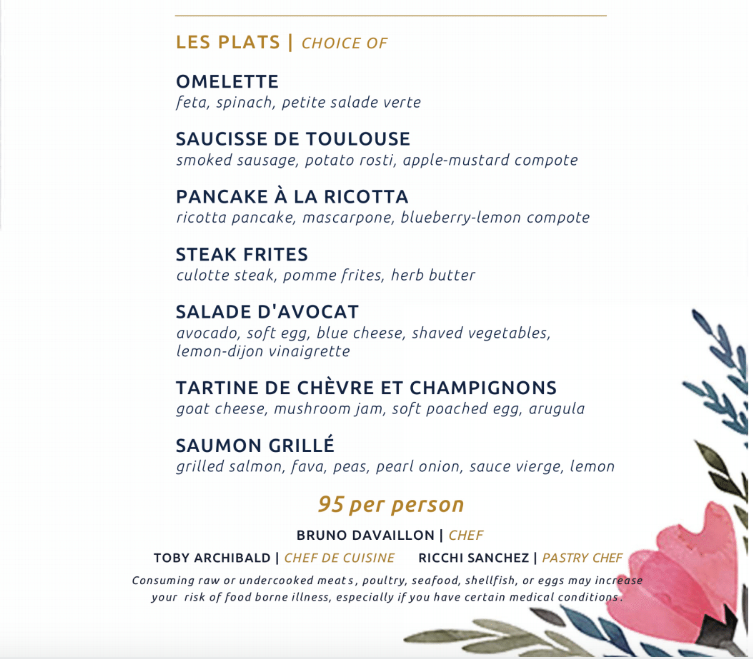 Easter brunch is available on April 21 and ranges from $51 to $58, depending on the entrée selection (beverage, tax and gratuity not included). Reservations are required and can be made by calling 214-571-5784. “Mercat will be serving regular Sunday Brunch from 10 a.m. to 3 p.m. with the addition of the following brunch Specials. Enjoy Your Brunch Favorites And The Annual Harwood Easter Egg-Hunt at 11 a.m and 1 p.m.
“Sunday Brunch from 11 a.m. to 3 p.m. Deep Fried Breaded Half Avocado with Lobster Tail and Goat Cheese, Hollandaise Sauce on the side.